Since 1965, Atlantic Coast Precast has been your choice for providing projects in Cooper City with precast concrete scuppers that are designed to manage the flow of rainwater from utters and downspouts, directing the flow away from your building foundation. Also referred to as downspout splash guards or splash blocks, these precast products are a cost effective method of long lasting rainwater management. 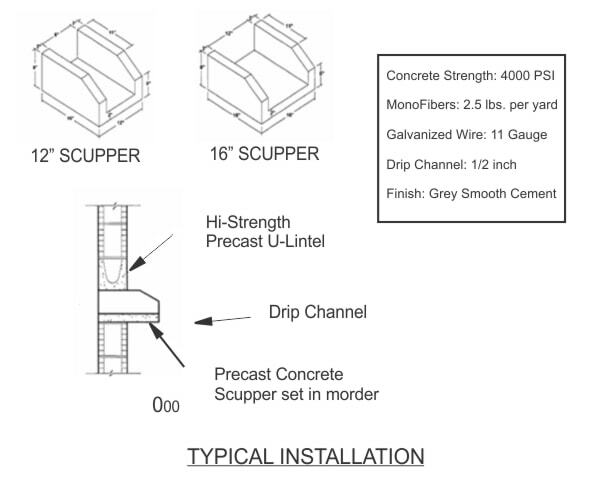 Both functional and low maintenance, our Cooper City precast concrete scuppers are designed with a monofilament microfiber concrete additive in our concrete mix to increase strength and durability. In addition to our stock styles, using your drawings, samples, or specifications, the team at Atlantic Coast Precast has been creating custom products for contractors, architects, engineers, and designers based on their project needs and rainwater intensity. Fully customizable, in Cooper City, precast concrete scuppers are a durable way to protect your home or business. The process begins with a cast of your design, with molds that allow for flexibility to change the installation as necessary. Available in sizes from 8" to 18', providing adaptability for every installation, precast concrete performs year after year, increasing strength. Protect your building's foundation by trusting Atlantic Coast Precast!